I've got a bit of applescript that I wrote that presses a couple window buttons on screen for me. On use, I get a pop-up saying I need to grant permissions in 'Security & Privacy -> Accessibility'. The checkbox to enable permissions does not work; it's not greyed out, it just doesn't take. From this, my theory is that the accessibility permission mechanism is seeing the app as two different names -- com.company.applet vs install path. But I don't know enough about macOS to proceed with troubleshooting. Can anyone help me understand what's going on? Does anyone have ideas on how to get this working? My build process is to feed my applescript into osacompile, which generates the ~/Applications/applet.app bundle. I then manually add CFBundleIdentifier with /usr/libexec/PlistBuddy -c 'Add :CFBundleIdentifier string "com.company.applet"' ~/Applications/applet.app/Contents/Info.plist. If I leave out the plist CFBundleIdentifier update, the application still fails the accessibility check. I can build the bundle in Script Editor and everything works. However, this is not a desirable long-term solution; as I want to keep everything in version control. The generated artifacts from Script Editor are binary, and thus unsuitable for git. Finally, it looks like in previous versions of macOS, I could have modified TCC.db directly, but now all my writes fail -- elsewhere, I've seen this attributed to SIP. I don't want to disable SIP. Browse other questions tagged applescript . 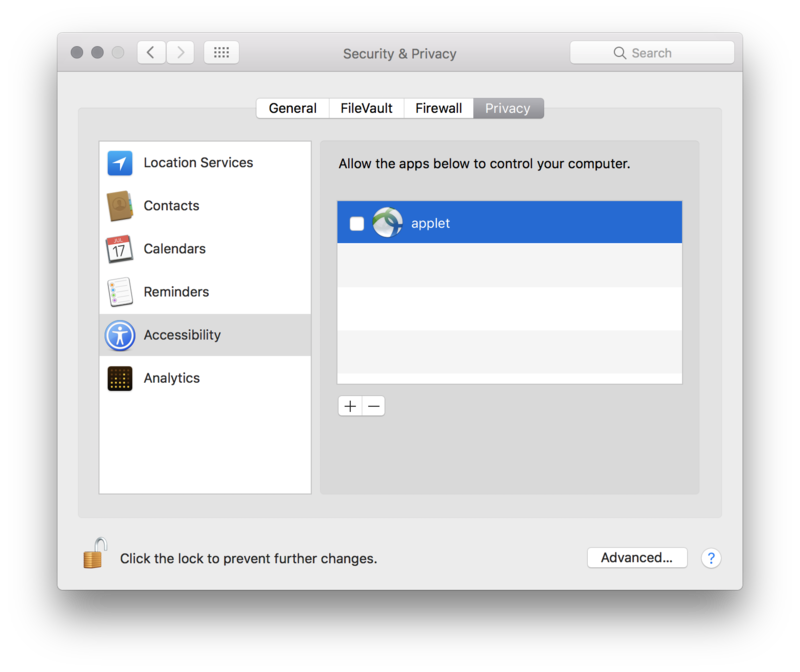 How do I give accessibility permission to my AppleScript and System Events in Mavericks?